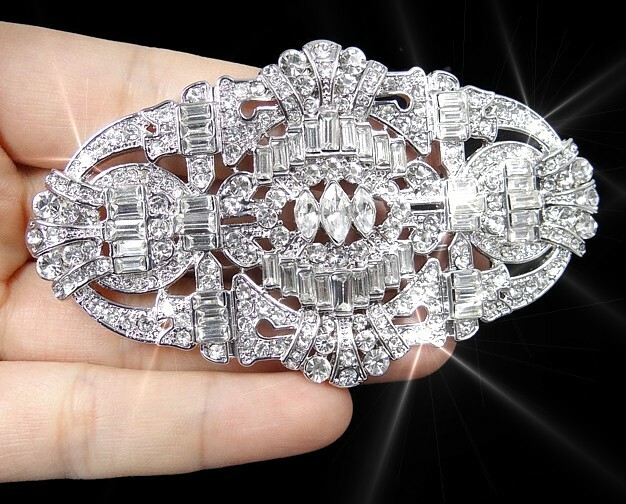 This spectacular brooch simply screams class and quality. Inspired by the Art Deco period, with a myriad of geometric shapes, created in marquise-shaped Swarovski crystal baguettes, novettes and shimmering multi-size circles, it's a triumph of design and sparkle. Wear it wide. Wear it long. It's big, bold and beautiful and designed to be talked about! Everyone will be mesmerised by its dazzle factor. Size: 8.3cm (2½") x 4.8cm (1½").